A properly installed paver patio adds value to your home while providing a space for outdoor entertainment or an accent to your garden. Pavers are typically made from either brick or concrete. Brick pavers have a classic look with long-lasting color and little maintenance, but this paving option comes with some aesthetic and functional disadvantages. Considering the drawbacks helps you determine if brick is the best paver option for your outdoor project. Variations in brick sizes can make installation challenging. Brick pavers often cost more to install than concrete pavers or other patio materials. You'll spend between $3 and $5 per square foot if you do the work yourself or $12 to $18 if you let a professional do the work, according to Houselogic. If you decide to handle the work, you'll also need a special saw used to cut the bricks. A rental can cost up to $95 per day. You can save costs by planning ahead to do all cuts in one day so you don't have to rent the saw for multiple days. In general, expect to pay between 15 percent and 20 percent more for brick than you would for concrete, according to Today's Homeowner.com. Because they are poured into forms, concrete pavers come in a wide range of sizes, shapes and designs. Brick pavers come in fewer choices, with most appearing as the typical rectangles. Bricks get their color naturally from different types of clay. This means the pavers hold their color better, but you also have fewer color choices than other paver materials. You also have fewer size options when you use brick pavers. Most are small in size compared to the larger concrete pavers on the market. The small size of brick pavers makes them tedious to install. You need to place more pavers to cover the same area than you would with larger concrete pavers. Since each row of brick pavers is usually offset from the previous row, you'll end up with quite a few bricks that need cut. The cutting adds extra time and work to the installation process. You may also notice slight differences in the sizing from one brick paver to the next. The dimension differences can throw off your installation or make your rows look skewed. Brick pavers are made specifically to handle the foot traffic that patios and walkways receive, but over time, heavy traffic takes a toll on the bricks. The brick pavers have a greater chance of cracking or chipping than other paver materials, according to Today's Homeowner.com. 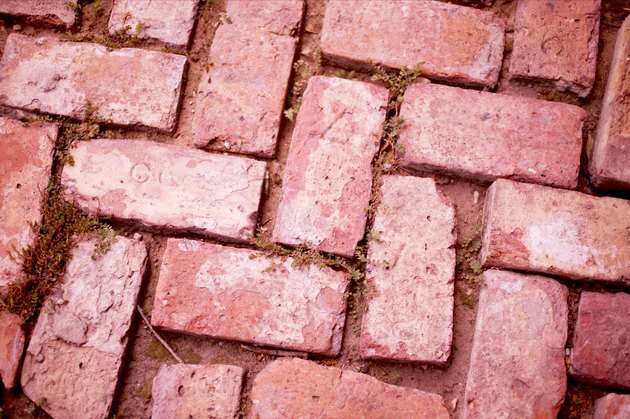 Unlike bricks used on walls, brick pavers aren't generally held together with mortar, so you can replace a broken brick. Some small chips and cracks add an aged look and may not be noticeable since the brick pavers are colored throughout the material.